Make your own free liquid organic fertilizer when your garden needs a tonic to boost growth. These simple recipes work better than commercial products, and can be made from what you have on hand. One of the criticisms of organic fertilizers is that they work very slowly. When your plants show signs of nutrient deficiency or slowed growth you need a quick fix. A liquid organic fertilizer can give you dramatic results fast. You will need something to brew your fertilizer teas in. I like buckets with lids. I don’t know a single gnome that can lift a 5 gallon bucket, but it might be ideal for you. Any size is fine. Put holes in the lid to let gas out and air in. The lid keeps mosquitoes out. Manure is nothing more than digested plant material. Herbivores are just living compost tumblers that quickly break down organic materials. Any manure is fine except cat and dog. Those shouldn’t be used on vegetables because of the parasites they may contain.I prefer poultry manure because it contains more nitrogen than other types. Poultry manure contains the urine as well as solids. The birds also digest plants or grains more completely, so the manure dissolves better in the tea. But, any herbivore manure will work. Fill a bucket half full of manure and then to the top with water. Cover the bucket, with holes in the lid for air. Leave it to stew for at least a month, stirring about once a week. That’s it. When using the tea, dilute it with one part tea to about 10 parts water and apply at the base of your plants. Some like to strain the tea. I like to let the undissolved residue accumulate under my plants as mulch. Yes, weeds make great liquid organic fertilizers. You probably put most of the green weeds and plant residue into your compost pile. But you can also brew a great tonic from that same green residue. Plants harvest nutrients from the soil to grow new cell tissue. As your weeds and residue steep in your tea bucket, those same nutrients will again become available to feed your new plants. Different plants harvest different minerals, so a good mix of plants will improve the tea. Green plants and grass clipping will dissolve quickly in water, making your tea a more potent tonic. Fill the bucket half full with a mix of weeds and green plant matter, including grass clippings if available and then to the top with water. Stir it a couple of times each week and let is sit with the lid on for at least 3 weeks. Dillute the tea 10 to 1 with water and apply to the base of your plants. Comfrey tea deserves special mention. Comfrey is an old time livestock feed, eaten green or as hay by cattle and other livestock. You should grow some in a corner of your garden. Comfrey is a perennial. It grows prolifically, so be prepared to contain it. It is propagated from root cuttings and any piece or root left in the soil will grow. Brew comfrey just like any weed tea. Comfrey tea makes a powerful liquid organic fertilizer. The roots run very deep and pull up minerals that other plants cannot reach. It is particularly rich in potassium. Comfrey is also one of the few plants rich in vitamin B12, which stimulates rapid root growth. B12 reduces transplant shock, so use comfrey tea (diluted) at transplanting time. If you live near the coast, seaweed is plentiful on the beaches for the gathering. Seaweed is rich in minerals and nitrogen, and can be brewed into a potent liquid fertilizer. Seaweed is salty and that can affect your soil, so rinse it thoroughly before putting it into the bucket. Chopping it up will also speed the process. Let it steep in the bucket for 3 to 4 weeks. Dilute and use as you would any weed tea. Never throw an eggshell away. They are high in potassium and calcium, both essential plant nutrients . You could put them in the compost pile . But, they are even more effective if they are dried, crushed and turned to near powder in a blender. Put the crushed shells of one to two dozen eggs into the fertilizer teas as you make them. There you have it, several ways to boost the productivity of your garden with your own homemade liquid organic fertilizer. Neem (Azadirachta indica) has worldwide medicinal and agricultural applications as a non-toxic alternative to synthetic chemicals for both curing and preventing disease. Neem Trees are used for reforestation, because it can grow well in dry conditions and sheds leaves all year round. Neem is mentioned in the Indian Vedas. Neem is beneficial for all human skin disorders, the skin of animals and plants and the skin of the Earth. Neem sticks are used as tooth brushes, and neem extracts in toothpaste. Cavities & Periodontitis are caused by bacteria which are killed by neem (ANTIBACTERIAL). Neem is ANTI-INFLAMMATORY & ANTI-ULCEROGENIC (cures inflammation and ulcers). Fed to livestock it is nutritious, medicinal and ANTHELMINTIC (expels parasitic worms). It is part of sustainable agriculture as a fertilizer & pesticide. Totally non-toxic to plants, people, birds, fish. In the fight against malaria, neem acts both as insect repellent & an ANTIMALARIAL (anti-viral oral treatment for infection and relief of symptoms). Alternative to conventional pesticides (more effective, non-toxic, selective). There is no need for farmers to isolate active ingredients for synthesis. Neem contains hundreds of beneficial compounds complete with packaging. Why were attempts made by large pharmaceutical companies to restrict its use? Vandana Shiva talking about freedom from intellectual property laws. Governments and corporations were restricting use of Neem, so people all over the world successfully fought back. THE CHALLENGE NOW FOR NEEM- is against monoculture plantation projects that are funded by corporations. Neem has an invaluable role in the biodiversity of our Ecosphere. To grow it in isolation does not benefit other plants or the Neem Trees.. We must cultivate healthy Wild Neem Trees which live with other wildlife and help to support it. Large Corporate Neem Plantations damage land and produce inferior trees, while paying workers slave wages. The collection of nutrients on top soil may cause salination of the soil. The neem trees do not have optimal conditions to mature properly and do not generate the same variety of active components. The land is owned by corporations, who do not pay workers a fair wage. www.earthworkstrading.co.uk is an excellent UK-based supplier of wild neem from Africa. "A TREE FOR SOLVING GLOBAL PROBLEMS" -National Research Council, Washington, D.C. 1992.
http://www.ecofilms.com.au Rosina Buckman shares her secret for making compost chopped very finely. Rosina Buckman’s front garden is right out on the suburban street. A number of corrugated colour-bond Zincalume planter beds dot her front garden. Rosina is keen on growing food in her raised beds. Lettuce and herbs spill out of her tanks as she exuberantly explains how she keeps the plants fed. “It’s my Chop Chop Compost system.” she tells us picking up her meat cleaver. Rosina who is a retired pensioner wields her cleaver in the air, giggling with glee as she throws a heavy timber plank over her wheelbarrow and proceeds to demonstrate her secret method of making good compost. Rosina shares a little known secret about compost worms and the soil. It seems to work because her garden is bursting with fruit. Tangelos, lemons, passion-fruit and the biggest New Guinea bean we’ve ever seen dangles above the front entry to her house. The bean is past its optimal eating size because Rosina is keeping it for it’s seeds. And seed raising is what her garden is all about. Tiny self seeding plants pop up out of the straw mulch all over her garden. Rosina encourages self seeding plants to grow. Small wild tomato plants pop out of the soil in the most unlikely places. Rosina explains the secret to her success with growing vegetables in her raised garden planter beds. Although the tanks are about two feet tall Rosina likes to build up the base of the tanks by recycling all her old woody prunings. Having demonstrated her Chop Chop Compost method, Rosina takes us to her worm farm. Multi layered black bins store her fine chop-chop prunings. “I have a huge crop of worms now because I know how to look after them.” she said. Chop all your vegetable matter for your compost down into small pieces. It will break down faster and keep the compost worms happy. http://www.ecofilms.com.au Rosina Buckman explains how to build a raised garden bed in a tank. Recently when filming with Permaculture gardener Rosina Buckman, we asked her how she managed to grow her amazing vegetables in her raised bed gardens without importing a lot of expensive soil. These tanks were raised off the ground and faced a sunny spot right out at the front of her house. Rosina responded that we need to look and think about our garden beds the same way we approach a compost heap. “All you have to do is think of it as a great big compost bin.” she said. Rosina cleverly asks her neighbors to donate their pruning and discarded vegetable matter. Most people are only too happy to oblige to get rid of their stuff for free. Rosina first lays out the bulky stuff, palm fronds, tree branches and woody material as the base of her raised garden. This bulky stuff will take the longest time to break down so it all sits at the bottom of the bed. Rougher mulch, leaves, wood-chips, cardboard packaging and carbon based material then forms another layer on top and like a thick lasagne the varying layers go to build the raised garden bed. In fact very little organic matter leaves her home in the rubbish bin. “Why throw it away when you can use it to grow your own food?” she said. When building your raised garden tank bed, its also important to add something green or even a manure of some sort as this will act as the “fire” or nitrogen material to activate the pile. Because the neighbours all have large front lawns, getting their green lawn clippings is an easy way to build up your tank garden bed. One of her methods to get bacteria, microbes, worms and other life into her soil is to feed the soil a mixture of Kelp and Molasses. You only need a small cup of each ingredient mixed with a bucket of water poured into a wheelbarrow for this method to work. The straw mulch or bale of hay is then dunked into the mixture and turned over until it is thoroughly moist. Bacteria naturally cling to straw and hay so you can be sure you have enough life dormant already. It only needs to be activated to spring into action. The cocktail of Kelp or Seaweed extract which you can buy in concentrate form known as Maxicrop in the US or Seasol in Australia will encourage the bacteria to multiply and get to work on building your soil. Encouraging soil life is a prerequisite to getting your plants to grow well. Molasses encourages the microbes to frenetically ramp up their numbers as the sugars stimulate their activity. The Kelp is laden with sea nutrients commonly missing from plants and land-based depleted soils. Adding extra minerals and nutrients into the mix means the vegetables grown are laden with nutritionally dense food that are also good for you. One thing you will notice in the YouTube video above is how fertile the surrounding soil is around Rosina’s raised garden bed. This is because she actively allows her plants to go to seed. Rosina allows the strongest plant to survive and its an excellent way to allow nature to select the best variety of plant suited to her locality. The little “volunteers” as she calls them are allowed to grow and the best kept to future use. These seeds are then donated to her friends and neighbours and earmarked as plants best suited to grow in your region and locality. 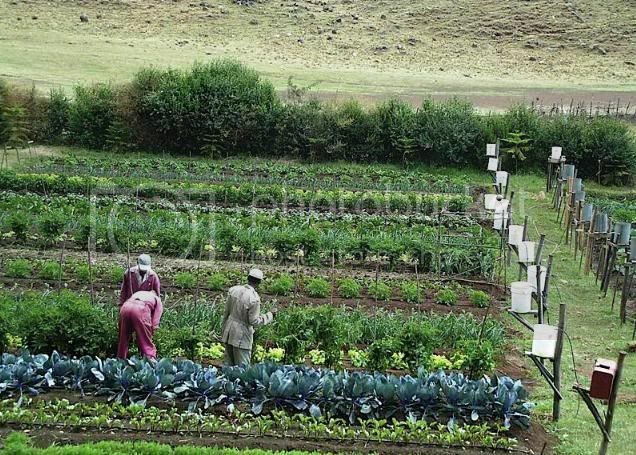 With growing water challenges and a changing climate, one simple technology that is gaining a foothold for subsistence farmers in Africa, India, and at least 150 other nations, is that of drip irrigation. 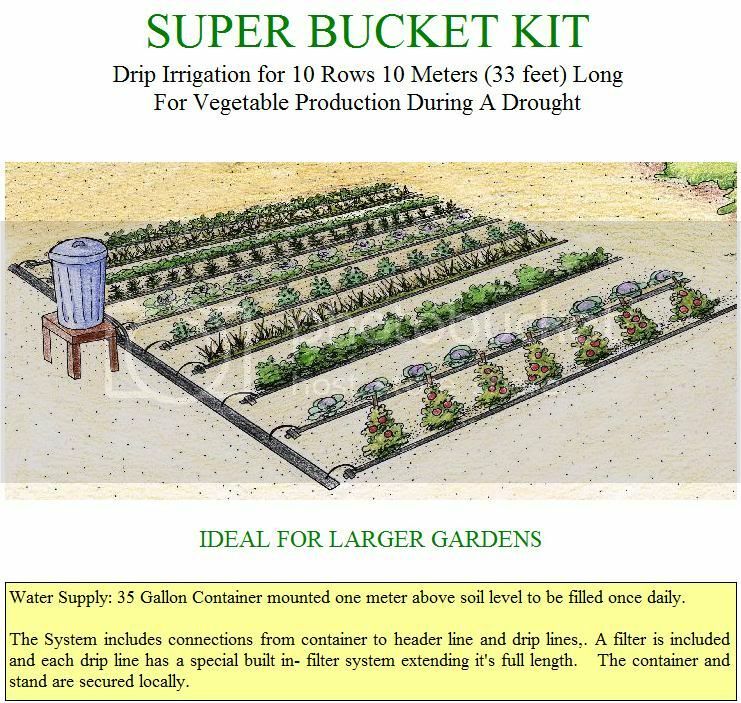 According to Ezemvelo Eco Campus Blog, "Studies in Kenya have shown that two of these kits can provide the water needed to produce enough vegetables to feed a family of seven during the dry season." The following instructions for setting up a bucket garden in Africa, are from chapin living waters. Make a stand with two posts and crossbar. The bottom of the bucket must be at least 1m (3.3 feet) above the ground. Place crossbar higher if bucket is suspended. Set up bucket at one end of the garden; if not level, place bucket at the high end. Make raised beds of soil 1m (3.3 ft) wide, 15cm (6 in) high, and 15m (50 ft) long for 2 rows; 7.5m (25 ft) long for 4 rows; or 5m (16.5 ft) long for 6 rows. If the garden extends into the rainy season, raised beds allow for water runoff. Dig a 30cm-deep (12 in) trench down the middle of the area where the bed will be. Place organic matter (banana leaves, grass, maize stalks) in trench. Cover organic matter with manure (80 liters (20 gal) per 15m (50 ft) row). 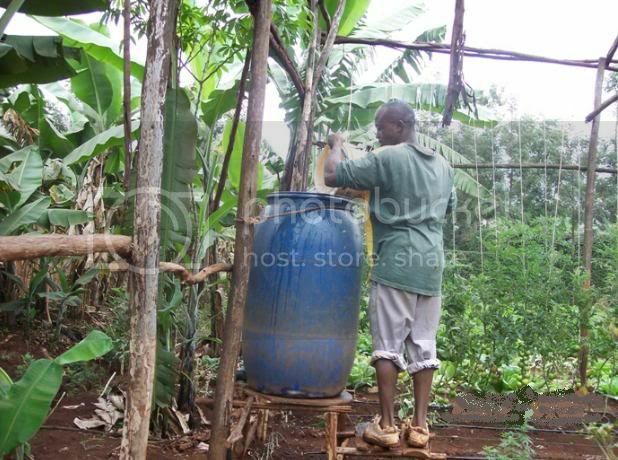 Pour several buckets of water (80 liters per 15m row) over manure. Fill trench with soil and level off, making bed 15cm (6 in) high, straight, and flat. Break up large clods of soil so that drip tape lies flat. 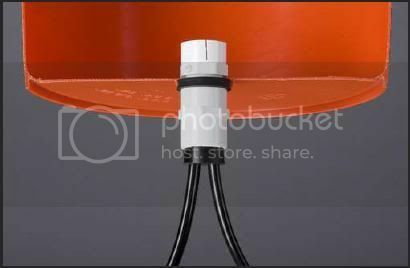 Proceed with setting up bucket drip system which should last 5-7 years, if taken care of. 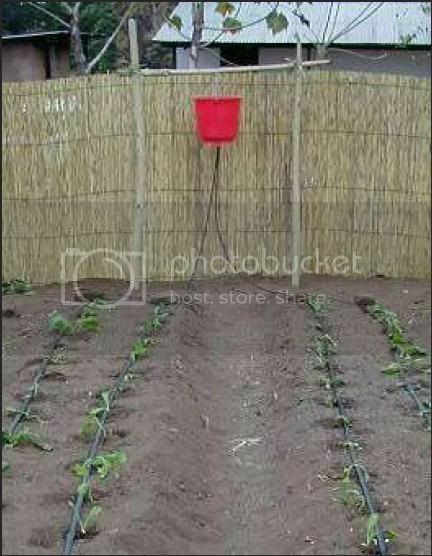 Since a picture is worth a thousand words, I've put together some photos to illustrate how bucket drip irrigation works. 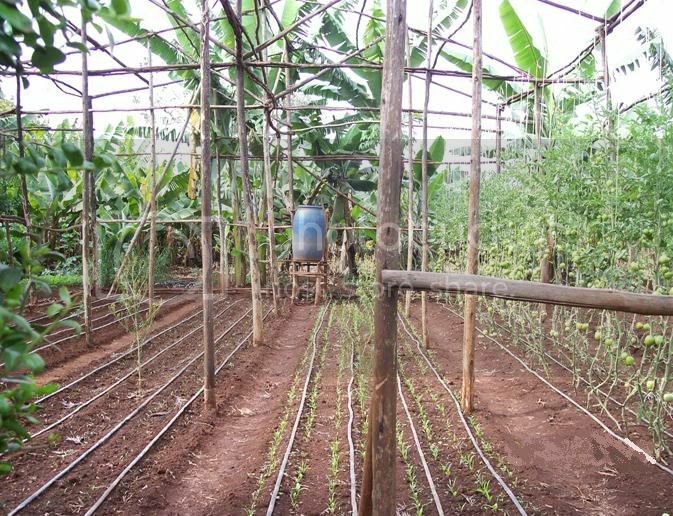 Also, see Drip Bucket Irrigation for additional simple, inexpensive and innovative ideas for setting up a gravity drip irrigation system.